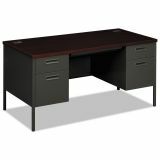 HON Metro Classic Double Pedestal Desk, 60w x 30d x 29 1/2h, Mahogany/Charcoal - When people picture the definitive steel desk, what they see is Metro Classic from HON. This retro-styled collection features up-to-date amenities and best-in-class construction. The square tubular steel legs are painted to match the body, and the molded polymer handles are sculpted to match HON 500 Series lateral files. 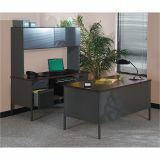 The top surface is easy-care laminate that's scratch-, spill- and stain-resistant. The drawers feature Tru-Fit mitered fronts that align perfectly to the desk when closed. Central locking opens all drawers with the turn of a single key. 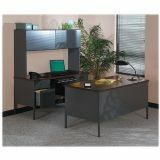 In addition, every component has built-in wire management, and all desks and credenzas can be outfitted with stack-on hutches. Metro Classic looks back on great style, and looks forward to great performance.